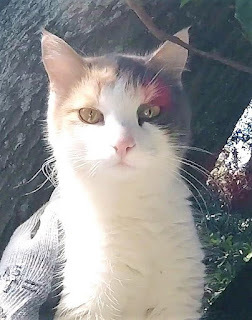 A beautiful and friendly calico cat just showed up at Joe's house one day and introduced herself to him. Joe was a dog person and didn't have much experience with cats, but this one was just so relaxed, friendly and likable. For the first time, Joe was beginning to see why some people are so attached to their cats, because he was quickly getting attached to this one. He asked around, but no one knew the cat or to whom it might belong. She was a bit of a mystery. The next day, the cat was still hanging around, and Joe was relieved and happy to see her. 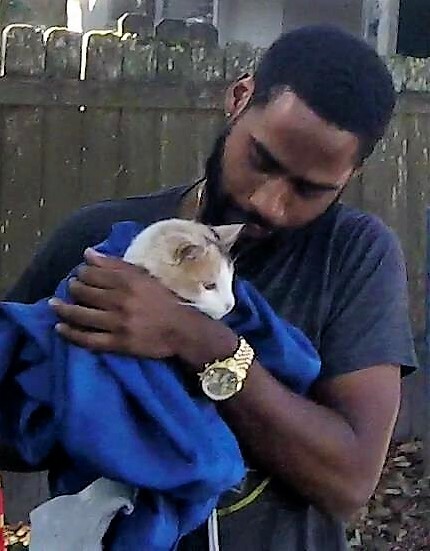 Not only was Joe getting attached to the cat, the cat appeared to be getting attached to Joe. He was even thinking about keeping her. On the third day, however, he did not see her and began to worry. He looked and called around for her and, after several minutes, heard her responding to him. 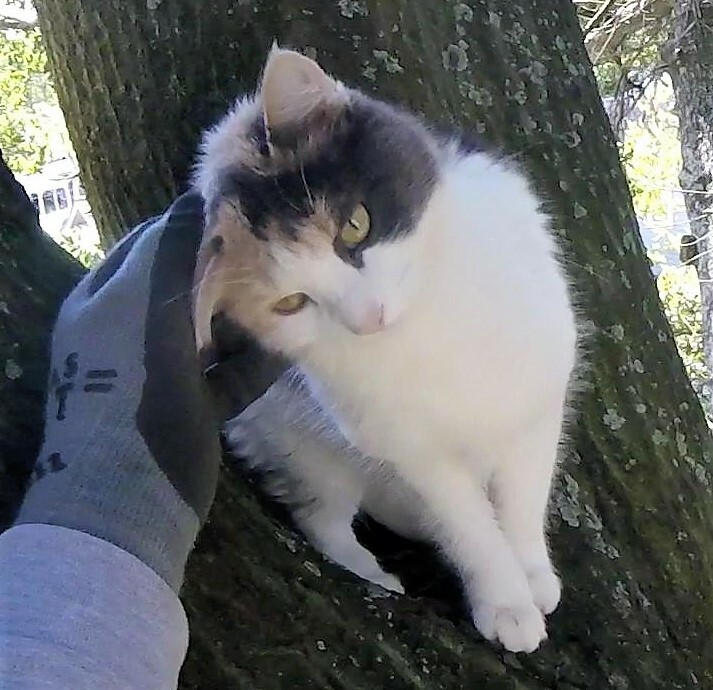 It took a few minutes before he could locate her cry coming from up high, but he found her up in a neighbor's tree. Joe was relieved to find her, but how does he get her down? He tried to coax her down, but as much as she wanted down, she didn't know how to do it. 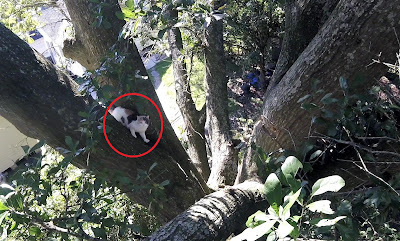 Joe went into action calling everyone he could, but he ran into all the same discouraging dead-ends that most people encounter when trying to find help for a cat stuck in a tree. When he called Animal Control, however, they gave him my number and, with it, a little bit of hope. I could hear how tired and discouraged he was on the phone when he called me, but his mood changed dramatically when I told him I would be glad to help. 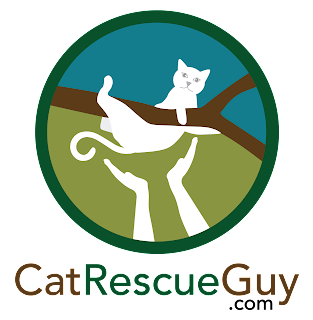 After so many other disappointing calls, he was surprised to hear that I not only took it seriously and cared, but also would actually rescue the cat. I met Joe at his house, and he took me into the backyard next door to show me where the cat was. The very large oak tree was just across the backyard fence in the back neighbor's yard, and access from that side was much better. Joe had already talked to all the neighbor's involved and got their permission for me to be there, so we drove over to the next block and approached the tree from that side. The cat was about 25 feet high in the massive union where the trunk split into several large branches that arched high and far in all directions. I had only one place to tie my rope that would allow me to get reasonably close to the center of the tree where the cat was. I set my rope there, and that process made the cat a little nervous. 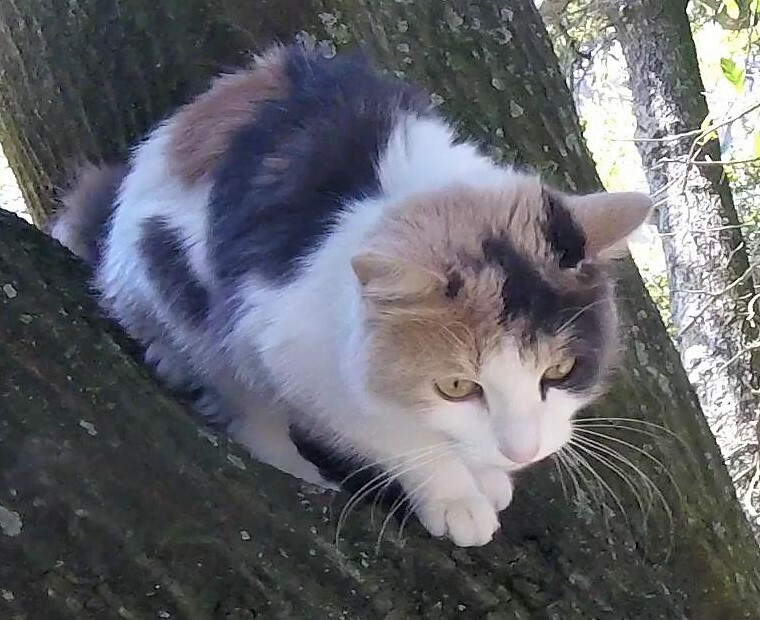 She moved just a short distance to a different spot in the tree, but was still within my reach. 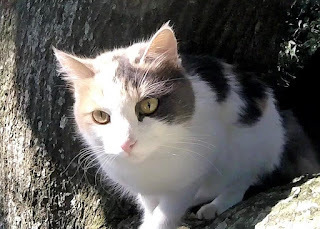 I knew she was normally a friendly cat to strangers, so I needed to take care that I did not frighten her too much. If she became frightened and wanted to get away from me in this tree, there is no way I would be able to follow her on such long branches. 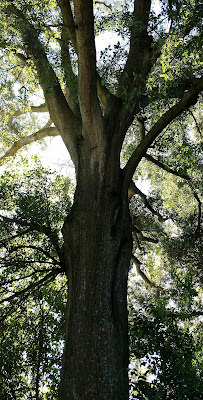 I climbed up and swung over to one of the lower branches. To get to the center of the tree, I had to sit down on the branch and slide under another branch. Once I did that, I was almost within reach of the cat. Fortunately, she remained relaxed enough to greet me, and she sniffed my hand when I reached out to her. She let me pet her, and she pushed her head into my hand with the realization that I was friendly. I visited with her there for a few minutes when she decided to jump over to the other side of the branch union to be a little closer to me. I prepared my cat bag on my arm and spent another minute petting her. Once she was in a good position, I grabbed her by the scruff, picked her up and pulled the bag over her. She felt betrayed and fussed at me, but I had her safely in the bag, and she would feel better shortly. I went back down and handed her to Joe who was now very relieved to have her down. The bond he felt for her was now complete, and he already had a name for her: Alora. He held her in the bag and talked to her to calm her down. She relaxed very quickly once she realized that he was there. He let her poke her head out of the bag, and she was even more satisfied now that all would be fine. When I saw Alora's head poking out of the bag, however, I was surprised and concerned that she would bolt and possibly head back up a tree again. While my concern was generally justified for many cats, it was misplaced with her. She remained calm and did not appear to be a risk at all. I held her in the bag while Joe stepped over the back yard fence to take her home. I handed the bag to Joe over the fence, and he set her gently on the ground and pulled her out of the bag. "She is a sweet-heart," he said. "I'm going to keep her." Before I left, I scanned Alora for a microchip but did not find one. There were no reports of a lost cat matching her description on the local Lost Pets page, so it appears that she has found a new home with Joe. And it looks like Joe has found a new love.